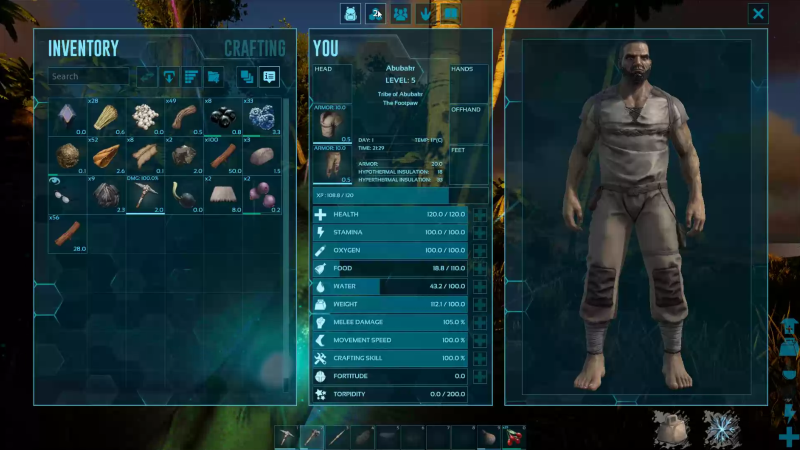 MMO MMORPG News·Articles·ARK: Survival Evolved Review: It’s finally out! What has it been, like, 2 years since ARK first went into early access? Over the years the game has risen and fallen in popularity. Within a month of entering early access, the game sold over 1 million copies. I mean, when we were teased with so many images and videos showing off dinosaurs that can be tamed, all during the survival game craze, there was no doubt that the game would sell like hotcakes. While the game was initially scheduled to be fully released in June of 2016, it kept getting delayed until finally releasing on August 29, 2017. Was this long beta period worth it? Is the game much better than it was two years ago? Read on to learn more about ARK’s current state! To be honest, when I first booted up the game after not having played for more than 2 years, I couldn’t tell what changed. To be fair, I’m not a huge fan of survival games and prefer faster paced shooters or MOBA/ARTS games. However, I do quite enjoy watching others with strong roleplaying skills or humor play these kinds of games. So, while I had not played the game, I continued to tune in on websites such as Twitch. It was only after loading up my old first impressions article that I realized how far the game had come. Fundamentally, the game remains the same. A typical session will still feature the same stuff: collecting, crafting, building, taming, and fighting. The base game has not changed but has been polished very nicely. Everything just looks and feels better. The user interface is much cleaner, the process of jumping into a game is much smoother, and the visuals show a clear improvement. For those unfamiliar with the game, ARK throws you onto an island (or one of the other maps) with absolutely nothing. From that point on, it’s you against the world. Build yourself a home, catch some prey, pick some berries, or go explore. As long as you can keep your vitals up, you’re free to do as you see fit. The game hinted at a story being present but most of the time you’re just playing in a sandbox, writing your own stories. Ark can be played offline or online but, like with most games, playing with others is bound to be a lot more entertaining. It can be hard to create a story for yourself, by yourself. Aside from having to gather resources, the game uses a level progression system allowing you to level up your stats and unlock additional blueprints for crafting. This system allows you to customize your character depending on how you see yourself playing the game. That is, you can increase your health and damage if you’re planning to fight for your survival or increase your weight capacity and speed if you’re hoping to appease your creative side. Additionally, it helps guide you into the game rather than overwhelming you instantly with hundreds of items available for crafting. 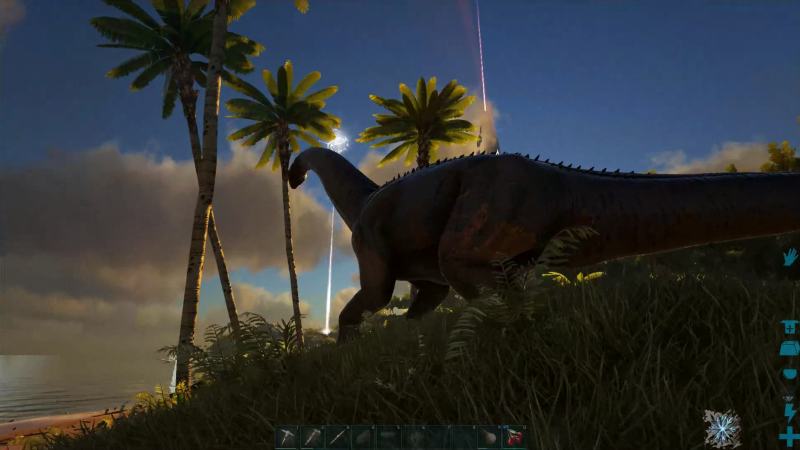 What sets ARK apart from other survival games are the dinosaurs! The game is set in prehistoric times (although you can eventually research to craft guns) with dinosaurs roaming the world. These dinosaurs can be passive, aggressive, tiny, or massive. There are so many of them to discover and tame! After knocking out these dinosaurs, they can be fed to slowly gain their trust. Once tamed, these dinosaurs join your team and act as your companions, aiding you in your mission to survive. However, while dinosaurs are what will likely bring people into the game, it is the survival, roleplaying, and player versus player aspects which retain them. With a good group of people on a nice server, the game can be a blast. Form tribes, forge alliances, wage war, build beautiful cities, and more! It’s up to the players to decide how fun the game is. This, then, poses a problem. With the game being as open as it is, not everyone will come to like it. A bad server and bad group can cause players to get turned off by the game. One may say that this is the players’ fault for not playing the game well, however, shouldn’t it be the game’s goal to offer a fun experience, and not just a potentially fun experience? In conclusion, ARK has grown into a great survival game over the years. It has been polished from its early access phases and is now presented as a beautiful and complete survival game, letting the players write their own stories and live their dreams. With its full release, there is a lot of downloadable content available, providing a lot of extra playable content with new maps, dinosaurs (or dragons! ), and items. A lot of this content is free while some requires you to pull out your wallet. The nice $30 price tag has also gone up to $60. It’s not a cheap game anymore. Maybe the extra content and polish can justify this price, maybe it cannot. I personally do not see myself playing this game or recommending it to most people. However, if you are an avid fan of survival games, ARK is not a bad choice. It is one of those games that is well made but will only be enjoyable by a select audience. While it may seem like the game has faded from the spotlight, there are still a solid number of players online at all times. With the release, we can see an increase of players (according to Steam stats), and this trend repeats with rises and falls every few months. Players will simply jump back in once more content is added and then move on to other games until the next patch. Don’t let the hype around the game fading fool you into thinking it’s dead, it’s still alive and well. Go and check it out! ARK is gorgeous. While it does require quite a powerful PC to max it out, the game really pushes the boundaries on the graphical side. There are still some improvements that can be implemented such as fixing the foliage. The controls are very well done. Nothing really feels awkward and you can use the game’s controls as a tool to get what you need done, easily. With all the extra downloadable content and updates, there is a lot of content available. However, even then, the base game does not change. This isn’t necessarily a bad thing as games like ARK leave it up to you to figure out how they should be played. Customizability is never lacking in ARK. You can design your character to your desires, level him/her up as you please, and build the base and army of your dreams. There are still a good amount of people playing the game. Like most games, you’ll run into great and not so great people. However, I would recommend finding a nice group of friends to play this game with. Doing so lets you enjoy the game without worrying about the community.